The Old City Cemetery in Macon, Georgia was established in 1825 and used by many until 1840. That year marked the opening of Rose Hill Cemetery, a much larger and more beautiful landscape that attracted most Maconites for decades to come. 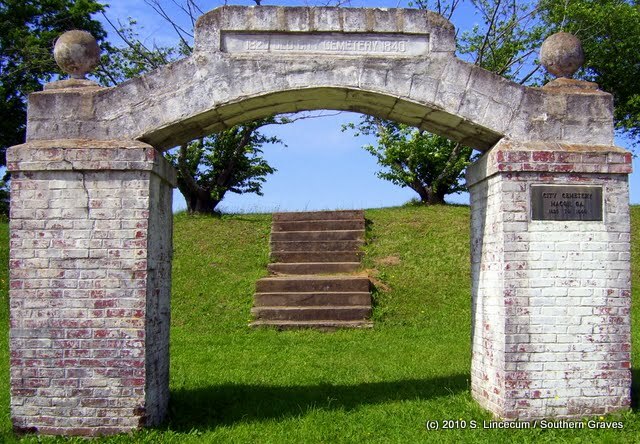 Today, the city of Macon maintains the grounds of the old cemetery. When I last visited in May of 2009, the grass was pretty and green and not too tall. That didn't hide the fact that the tombstones left in the cemetery were in poor shape and most of the brick walls surrounding family lots were crumbled. I did see several plaques stating restorations were done, many from the 1960's. All in all, the cemetery is a shell of what I imagine it once was. 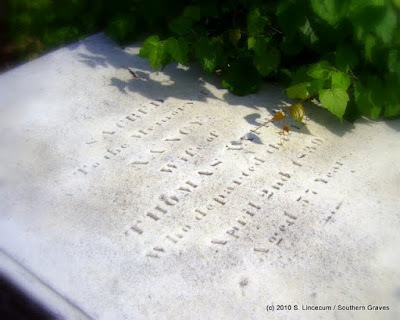 Some time ago I transcribed articles, took photographs of the cemetery and some of it's tombstones and placed them on the Southern Graves blog. I've since decided to create this page dedicated to the cemetery and some inhabitants that are bound to have been forgotten. Below is a listing of burials known to me. If you know of any individual interred in Macon's Old City Cemetery that is not listed here, or if you know of any burial listed that was relocated, please contact Stephanie Lincecum. those four acres, and there are only a few marks left to show the graves." Barker, Charles Wentworth - June 3, 1823 (1828?) Infant son of Nathaniel and Mrs. Mary Barker. Aged 3 months and 13 days. Beall, Hon. Robert A. - June 16, 1836 Aged 35 years. 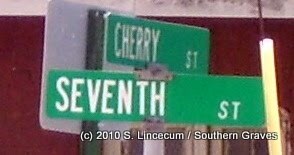 He was elected the second mayor of Macon. He was an accomplished writer, a brilliant orator, an able lawyer and a fearless leader in the State Rights party. He was, to his age, the peer of any man in the state. He was buried with the highest military and civic honors. An admirable sketch of his life is published in the first volume of Miller's "Bench and Bar of Georgia." 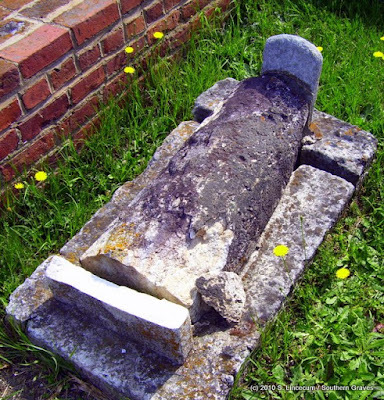 Benjamin, Hetty - 10th December 1850 Wife of Charles Benjamin, aged 41 years. A small monument was once in place over this grave, but it is all broken on the ground now. (1893) Blessed are the pure in heart, for theirs is the kingdom of Heaven. Bird, Dr. Thompson - July 1828 One of the original settlers of the town in 1823. Was buried by the Macon Lodge, the military court and the citizens generally. He was a grandfather of Hon. L. Q. C. Lamar. Bressee (Bressie? ), Susan October 15, 1797 April 12, 1838 Consort of William Bressee (Bressie? ), aged 41 years. Has a brick wall in good condition, but grave has sunken much. (1893) She was a kind wife, good neighbor, and all lament her loss. Butler, Infant Daughter - February 18, 1836 Infant daughter of David and Rebecca Butler, aged 3 years. Carter, John E. - October 24, 1837 A native of Boston, Mass., aged 20 years. Died in Macon. Though he passed away "a stranger in a strange land," as his epitaph recites, a nice tombstone was erected to his memory, upon which is inscribed, among other things, the following: "Thus died the stranger in a foreign clime, / Lovely and young in all manhood's prime; / Away from friends and parents to whom he was most dear, / And brother and sister too, who drop affection's tear." Cease then to mourn, enough for us to know, In peace rest his ashes, encircled in bright halo. His death was recorded in the 30 October 1837 Macon Georgia Telegraph: "Died, In this city, on Tuesday morning, 25th inst. John E. Carter, son of John H. Carter, of Boston, Mass. in the 21st year of his age." Cassels, J. W. - 1827 (1837?) Aged 20 months. Child, you must go. Clark, John - November 24, 1824 First interment in this cemetery, a painter. Collins, Harriet E. - April 20, 1834 Wife of Dr. Robert Collins, aged 31 years. Grieve not for me my dearest friends, Nor spend your tears in vain, I hope your loss in this vain world, is my eternal gain. Collins, Infant Son - 6th May 1838 Infant son of Robert and Eliza C. Collins, aged 4 weeks. Dannelly, Capt. William J. - June 1831 Represented the county in the legislature. He was the fifth intendant of the town, and had been justice of the inferior court. He was buried with military honors by the Macon Volunteers, which company he commanded, being its second captain at the time of his death. His age was 30 years. Davis, Eliza S. July 15, 1808 January 3, 1841 Wife of Charles Davis, Jr., born in Roxbury, Mass. A good Wife, a good Mother, good Daughter, and good Christian. Her death was recorded in the 5 January 1841 Macon Georgia Telegraph: "Died, In this city, on the 3rd inst. of consumption, Mrs. Eliza S. Davis, aged 32 years, wife of Charles Davis, Jr. of Roxbury, Mass." Ellsworth, Capt. John - October 1839 Aged 40 years. He was an officer of the Macon Volunteers in the Florida war. He was much esteemed and buried with military honors. One month after his death his wife died and was buried by his side. Ellsworth, Mrs. - abt. November 1839 Wife of Capt. John Ellsworth. Died one month after her husband; buried by his side. Fort, Caroline (Carolina?) Calhoun - 31st Aug 1837 Daughter of A. M. and R. W. Fort, aged 11 months and 23 days. Fort, Laura (Laurey?) Virginia - Sept 23, 1834 Daughter of A. M. and R. W. Fort. Aged 4 months. Gainer, Mrs. Cinderella - May 23, 1837 Wife of Joseph Gainer, aged 24 years. Light lie the sod over the remains of her who was once animated by the same life and quickened by the same pulsations as those she left behind to mourn her untimely departure. She was adorned with the noblest attributes of our nature, and possessed of those virtues that sweeten the paths of adversity and render the rough ways of life smooth. Reader, wouldst thou know more? She lived an amiable wife and died a Christian. Goodrich, Stephen (Steven?) S. - July 19th (18th? ), 1833 (1835?) Of Oswego, N.Y., aged 29 years. Healy, Lawrence - February 6, 1840 Aged 27 years. A native of the Parish of Cloon, county of Leitrim, Ireland. Slab erected by Peter Dyer. Hollingsworth, Thomas J. 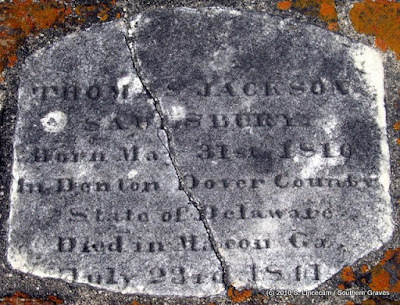 - June 6th, 1840 Aged 21 years and 4 months. Blessed are the dead who die in the Lord. Howard, Rev. John - August 22, 1836 The first presiding elder of the Methodist church in this city, and a man who took a leading part in establishing Wesleyan Female College. Removed and reinterred in Rose Hill Cemetery. Jennings, Robert Carter - 4 (14?) Nov 1837 Aged 21 (23?) years. Loving, Judy - May 24, 1844 Aged 60 years. McGehee, Rebecca Mary - 16th August 1836 (1830?) Daughter of Abner and Laura A. (Louise?) McGehee, aged 9 months. Mullholland, Thomas - Nov 22, 1837 A native of Ireland. Born in the county of Leitrim, parish of Cloon. Aged 72 (32?) years. This stone was erected by his brother, Michael Mulholland. Mulloy, Thomas - December 13, 1842 Aged 26 years. A native of the Parish of Meelick, County Mayo, Ireland. Slab erected by his friend George Ormsby. Napier, Thomas - September 30, 1838 A native of Virginia, for about fifty years a citizen of Georgia, aged about 70 years. These two graves have a good brick wall around them, an iron gate and it locked. (1893) [Thomas and wife Nancy.] 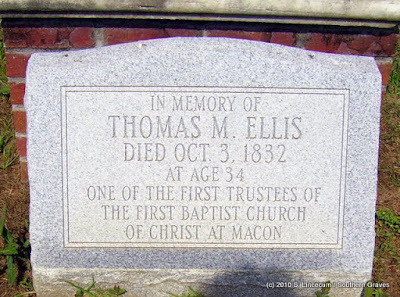 His death was recorded in the 2 October 1838 Macon Georgia Telegraph: "Died, On Sunday afternoon, after a short but severe illness, Major THOMAS NAPIER, one of the oldest citizens of Macon, aged 71." Newcome, Capt. Lemuel - October 1834 Aged 33 (38?) years. He succeeded Capt. Dannelly as commander of the Macon Volunteers. No man had lived in the community more respected. 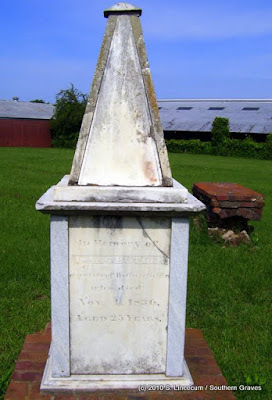 He was buried by the Macon lodge, of which he was senior warden, and the Macon Volunteers. Ormsby, John - Oct 26, 1841 Aged 31 years; a native of the Parish of Killarer, County Mayo, Ireland. Slab erected by his brother, George Ormsby. Pace, Mrs. Rebecca - 30th December 1838 (1828?) Consort of Thomas Pace and daughter of Jared Irwin, aged 51 years. Phelps, Jonathan C. - September 10, 1836 Son of Noel L. Phelps, of Farmington, Conn., aged 24 years. Phillips, Margaret Corhan - July 14, 1831 Infant child of John and Sarah Phillips. Aged 18 months. Russell, Sarah Ann R. C. March 17, 1836 August 8, 1838 Daughter of A. and F. Russell. Sage, Oliver F. - July 20, 1841 Son of Oliver and Sarah M. Sage, aged 10 months. 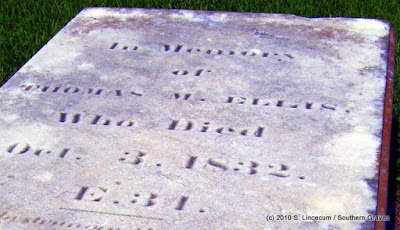 His death was recorded in the 23 July 1831 Macon Telegraph: "DIED, In Macon, on Wednesday evening last, Oliver F. infant son of Mr. Oliver Sage, aged sixteen months." Saunders, Emeline Buxton - November 6, 1834 Wife of Wright C. Saunders, aged 25 years. Scott, Nicholas - 13th (15th?) Nov 1837 Aged 42 years. He was born in the County Meath, Burrough of Navin, Parish of Dunarme, Ireland. Mr. Scott was a laborer on the Monroe railroad and died from a kick by a mule. Smith, Robert D. May 20, 1811 September 28, 1834 He lived beloved without a foe, died lamented in the bloom of life to bloom in the immortal state. Smith, Theodrick L. - December 22, 1839 A native of Virginia, aged 40 years. Traynor (Traylor? ), Francis - 6th (5th?) September 1837 A native of Monaghan county, Ireland. Aged 20 (26?) years. Erected by P. M. and B. (H.?) Traynor (Traylor?). Ventress, Capt. James - July 24, 1829 Age about 58 years. Walsh, Jane - August 5 (6? ), 1840 Erected by Maurice Walsh, in memory of his wife, aged 18 years. A native of Nenagh county, Tipperary, Ireland. Requiescat in pace. ?, Nina (Nelly?) - August 1838 A member of the Baptist church at Macon.